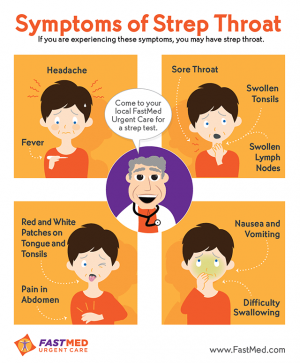 If you think you may have strep throat, it is recommended that you visit our FastMed walk-in clinic located on Conover Boulevard West in Hickory, NC. Our staff of medical professionals can diagnose strep throat, and recommend an appropriate treatment plan. Strep throat is a painful infection in your throat caused by the bacteria Streptococcus. It usually makes your throat feel sore and scratchy. Sore and scratchy throats are not uncommon, and only a small portion of sore throats result in strep throat. Trying to tell if you have strep throat may be difficult. There are certain signs and symptoms you should look at when trying to determine whether your sore throat is strep throat or something else. A sore throat can be caused by many things like allergies or viruses, but there a few ways to tell if your sore throat is caused by strep throat and not the common cold or virus. When you visit FastMed in Hickory, NC, your provider will also check to see if you are exhibiting these symptoms. Strep throat is usually treated with antibiotics that will kill the bacteria and prevent it from spreading to your friends, family, and coworkers. If left untreated, it can lead to more serious diseases including scarlet fever, rheumatic fever, or inflammation of the kidney. FastMed in Hickory, NC, Can Diagnose Strep Throat in 10 Minutes! It is easy to tell if you have strep throat at FastMed. Our Hickory, NC, clinic can perform Rapid Strep Testing with on-site lab work so we can have your results to you in as little as 10 minutes. You can walk in, or schedule an appointment, and you have the option to use our ZipPass feature to check in early online, and possibly reduce your wait time.